I don't know very much about this set. I have only seen it MIB on eBay once and the picture wasn't large enough to read the box very well. Could anyone give me anymore information? 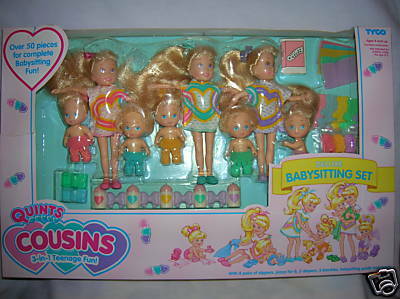 It seems to include 3 Cousins dolls and a set of Quints dolls. The box does say "Over 50 pieces for complete Babysitting Fun!" This site, its design, and all content within are Copyright ©2008 by Zuse unless stated otherwise. All rights reserved. Quints name and logo are registered trademark of Tyco, Inc. The Quints Guide is intended as a reference for collectors and is in no way endorsed by or affiliated with Tyco. All names, logos, and trademarks are the property of their respective owners. Copyrights for the pictures hosted on this site are held by their respective owners.